So micro-scale flow is — nice. It feels great, and makes for great productivity and reliable momentary happiness. And I’ve had several hours of this, usually after I drink a café doble and have only before me two hours to kill and a thick stack of teoría sobre el medio ambiente en relación con la sociedad to read. Awesome. But that’s not what I’m really talking about. That’s a nice moment, but then it’s gone. 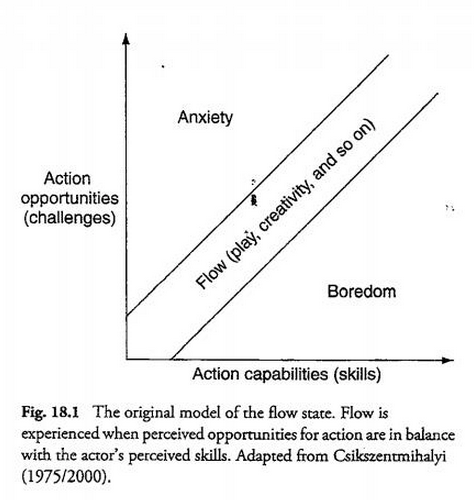 Flow state, I believe, can be achieved on a much larger scale; or, at least, Mindvalley CEO Vishen Lakhiani thinks so. In his widely viewed speeches and TEDx talk, Lakhiani describes how he turned his company around not because of busniess plans or venture capital but because be enacted a state of flow for himself and his company by monitoring and adjusting his environment so as to create conditions for flow state to regularly occur for himself and his employees. He puts it nicely: to personally achieve a state of flow, you must “be happy in the moment” and also, simultaneously, maintain “grand dreams for the future.” He describes four types of people: 1) People who are unhappy in the moment and have no dreams for the future. 2) People who are good and happy and so therefore don’t feel the need to think about the future. 3) People who are unhappy with their lives as they are but have grand visions for their future, and 4) People who are happy in their daily moment and still maintain grand dreams for the future. This fourth state would be considered (as opposed to micro) — macro-flow. But how to get there, and then stay there. That’s the important question. Great that Mr. Lakhiani has achieved this nirvana of mind and business that has resulted in the rapid growth of his multimillion dollar company, but how can I get there myself? Mr. Lakhiani’s suggestions are a series of progressive business practices that are meant to stimulate systematic happiness: He has his employees keep a gratitude log, which has been psychologically proven to increase one’s base happiness quotient He has an “awesomeness bell” which he rings “only in moments of sheer and total awesomeness”; He created a company ritual where employees get handsy with a statue of Wonder Woman and yell, “I will blind you with the light of my awesomeness!”; He distributes a portion of his company’s profits (not stock options) to his employees; He constructed a web app to provide a platform for coworkers to praise each other (and encourages them to do so); He limits their working hours, and tells them to use 5 hours of their 45 hour work-week studying a subject separate from their job; Group meditation, group sharing of outside interests, halloween parties, incredible company retreats, 3pm siestas— etc; happiness, happiness, happiness. Innovative stuff for the labor unions, but the great takeaway for us humans is to build independent and resilient systems of happiness into our lives to keep our happiness levels elevated enough so that we can be productive. The alternative to systems of happiness I’ll call band-aid happiness, which is the transient kind: one-more-cupcake, or one-more-pair-of-shoes, or one-more-interesting-article, by themselves, will never lead to anything but momentary happiness. Having arrived at that realization sometime towards the end of high school, I have generally considered myself against the direct pursuit of happiness. I still do not see happiness itself as a goal. A certain amount of it is necessary, as too little happiness will cause downward spirals, just as much as excessive “happiness” blinds you from the realities of life. But as Mr. Lakhiani does aptly point out, it’s about having sustainable systems of happiness that are independent of accomplishing goals or social politics or consumerism. This is a valuable takeaway. Why, then, for the last several weeks, have I been sub-flowing? This is me, personally, wondering here. I’m asking. I know, I generally like to be the blogger-with-the-answers, because at my well-marinated age of 21 I’ve got so much experience to boot. But I am frustrated, because I don’t like not-having-answers. I spend much of my life arranging these systems of happiness. I carefully and often reflect on what activities I do and do not enjoy, and then I arrange those tasks that I do enjoy in logical portions and sequences every day. I don’t work too hard, or too much. I work effectively, for a few hours every day, and spend the rest of my days pursuing other “enjoyable” elective tasks, (reading, writing, exploring the city, being with friends, etc). Why, then, for the last several weeks, have I been sub-flowing? I suppose at this point in the conversation, grief is a necessary mention, as there are always moments every day where this plays into my mood and actions. But I do not think that my general state is still fully a function of this external adversary, or perhaps I just can’t see it. I do not think that I have a nice conclusion to this post, and I am sorry for that. No full circles or pretty metaphors, and for the record, I did not achieve anything even mildly semblant of flow while writing this. It was more laborious than you’d think, though not overly time consuming. Thanks for reading, readers. May you each find your flow! Same here Alex. If either of us reaches that constant state of Flow, let’s share it with each other. Often times, hearing or witnessing one another’s experiences can be the “Ah Ha” (Oprah) moment to help us get to the same place.